Some people believe that you can fall in love with someone from the moment you see them. For them it isn’t about appearances, it is about feeling an instant connection which goes beyond words. For others the idea of love at first sight feels impossible and completely illogical. 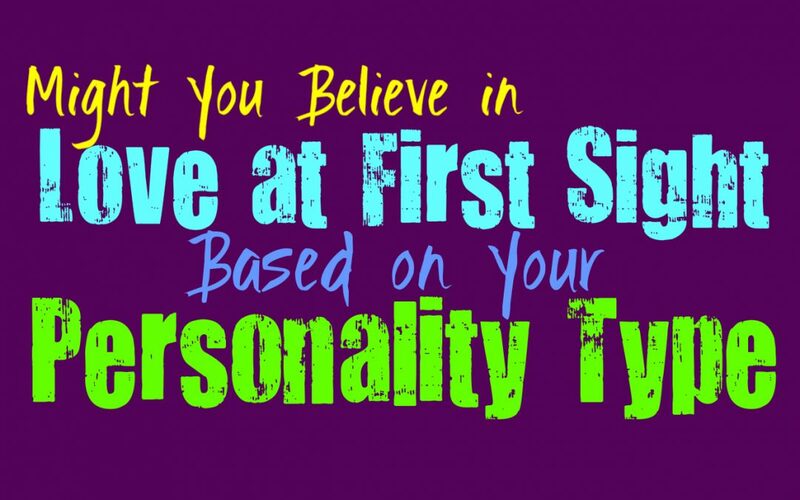 Here is how likely you will be to believe in love at first sight, based on your personality type. INFJs have both logical and soulful beliefs, which can cause them to go back and forth about certain things, especially pertaining to love. They might initially believe that something like love at first sight lacks the depth needed to truly fall in love with someone and mean it. At the same time they might change their minds if they come in contact with someone who sparks their soul from the moment they set eyes on them. INFJs will believe in it much deeper if they actually meet someone and feel strongly about them in a way that causes them to really believe in love at first sight. ENFJs are both logical and emotional people, and so their beliefs can sometimes vary because of this. They will sometimes try to approach things from a logical belief and this will cause them to have doubts about something like love at first sight. At the same time they can consider things from different angles and when their more emotional and soulful beliefs apply, they might find themselves feeling like love at first sight might be true. They can have a truly romantic side of them, and when this comes into play they might start believing in the idea of love at first sight. INFPs often do believe in love at first sight, but not in the way that some people believe in it. They often feel like their souls can make a connection with someone and feel that they will be close right away. While the INFP believes in digging deeper to understand someone and taking the time to truly fall in love with them, that doesn’t mean they don’t sense that it will happen right away. INFPs often have romantic ideas about things, and retain a sense of idealism when it comes to love. ENFPs have both logical and emotion aspects to their personality, and so they might believe in things like love at first sight. While they don’t often admit these beliefs to others, they do find themselves drawn to more romantic ideas. ENFPs want to believe in romance and want to believe that they can find something truly special and amazing. For the ENFP connecting with someone’s soul is something they might believe can happen immediately, even if really unlocking this takes time and a longer connection. INTJs aren’t likely to believe in things like love at first sight, since for them these feelings are based on something much more substantial. INTJs don’t believe that people can simply love someone the moment they see them, instead they believe in getting to know someone and the similarities you share. INTJs are logical people, but many of them to believe in love they just see it as a much more practical choice and connection. INTJs often see things like love at first sight as simply lust, and can recognize that it lacks real depth. ENTJs don’t often believe in things that seem irrational and lack some sort of logical reasoning behind it. For them love at first seems a bit foolish and like something that lacks real substance. They often peg this idea of love at first sight as simply lust, and that people are confused about what they are feeling. ENTJs aren’t completely lacking in a sense of romance, they simply believe in it in a more practical manner. For them falling in love comes from getting to know someone on a deeper level and understanding what truly makes them tick. INTPs are logical people and so they often shy away from believing in things like love at first sight. While INTPs don’t believe in actually loving someone at first sight, they do believe in feeling a connection right away. They can sometimes have a romantic side, but for them it is based on something more substantial than just an initial feelings or thought. They fall in love with who someone is and what they learn about them over time. For the INTP love at first sight often seems more like lustful thoughts that people confuse for something deeper. ENTPs are logical people who often have a surprisingly romantic side to their personality. For the ENTP loving someone is not about just falling for them at first sight, instead it is based on something deeper and more substantial. They often believe that love at first sight is just lust and that it isn’t really coming from something real. ENTPs can become rather drawn to falling in love with someone and developing something truly deep and meaningful, even if they aren’t open about these feelings or desires. ISTJs rarely believe in things like love at first sight, since this seems completely illogical to them. ISTJs are practical people who often see love as more of a choice than something as flighty as a feeling that can be developed in mere seconds. They believe in commitment and finding someone they are comfortable sharing their lives with. ISTJs are definitely not likely to believe in love at first sight when they are far more likely to look at things from a practical point of view. ESTJs don’t often believe in love at first sight, instead they see this as lust and not something truly substantial. ESTJs prefer a commitment that has been developed over time and has come from truly getting to know someone. ESTJs don’t find it easy to just fall in love with someone in seconds, instead they want to take the time to get to know this person and what makes them truly tick. ISFJs do often have a romantic side, but that doesn’t mean they believe in things like love at first sight. Sometimes like this doesn’t often make much sense for the ISFJ, since they believe that love is much deeper than this. For the ISFJ it is often easier to believe that loving someone comes from getting to know them and finding a true connection. They also believe in committing to someone, and this takes more time and effort than simply meeting them and loving them immediately. ESFJs can be practical people and so they might have their doubts about the idea of love at first sight. While they often believe in love and want to find someone to spend their lives with, the idea that this can happen instantly can often feel unrealistic. ESFJs might be open to the idea of love at first sight, but they often want to experience it firsthand to truly believe in it. For the ESFJ commitment is important, and to truly love someone they often feel it takes time to get to know them. ISTPs rarely believe in things like love at first sight, since they rarely believe in things they cannot see for themselves. The idea that people can fall in love so quickly, usually feels a bit unrealistic for them. ISTPs want something that is more tangible before they will actually believe it. They might even struggle with more romantic ideas of what love is, and instead believe in caring for someone based on who they are and making the choice to commit to them. ESTPs don’t often believe in anything they cannot see proven or seen with their own eyes. They believe in things that are tangible and struggle to really rely on those things that are too romantic. ESTPs might have a romantic side to them though, and might imagine the idea of falling in love with someone deeply. While they can have this side to them the thought of love at first sight often feels a bit unrealistic for them. ISFPs often do believe in love at first sight, since they are truly romantic people at heart. They believe in going after the things they want in life, and follow their hearts where they might lead. This can often cause the ISFP to romanticize things like love at first sight, and so they want to imagine what this might be like. For the ISFP these beliefs are based on a soul connection, and recognize that there is something there that cannot quite be proven. ESFPs do often have a romantic side to them, and so they might believe in things like love at first sight. They might go through cynical stages in their lives, but deep down they believe in these truly romantic ideas. For the ESFP it is important to follow their hearts and go after the things that feel right for them. They want to seek out love and passion, and so their hearts are always pulling them towards these things in life.